Does the thought of an after school job remind of you of slinging burgers and mopping up messes in aisle 3? Changing dirty diapers for a screaming toddler? Yeah, us too. As heinous as it was, those teenage experiences helped shape our future. Now it’s our turn to encourage Cambridge teens to take hold of their own futures. But this time, they luckily won’t have to carry a mop, or wear a uniform. The Cambridge Community Television School Year Production Program begins its 2009 cycle this month, and 13 local teens have the opportunity to participate in this fun and educational project. 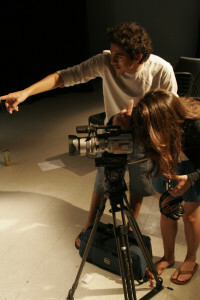 Students complete video assignments and pursue projects like any other freelancer, but they have access to CCTV’s expansive studio to complete these tasks. This means there are cameras, lights, and editing equipment at their disposal. And best of all, the teens are paid for their time. If you know any Cambridge teenagers who are interested in an exciting paid position, please email elisa@cctvcambridge.org. A contributing writer at Directoryofboston.com, Megan Johnson is originally from Connecticut, but has lived in Boston since age 18. She frequently writes for MenuPages Boston, Butterfly Diary, Reinventing Beauty Magazine, and SweetTalk on the Spot. You can visit her website at www.meganjohnson.tumblr.com.